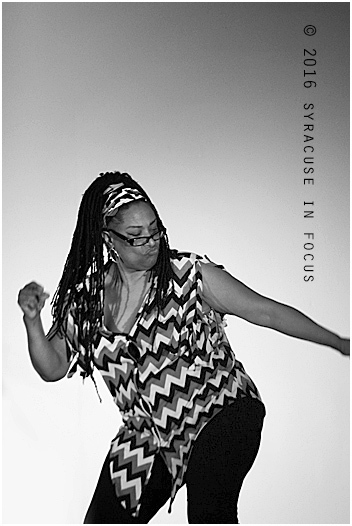 Flighty from Syracuse in Focus on Vimeo. 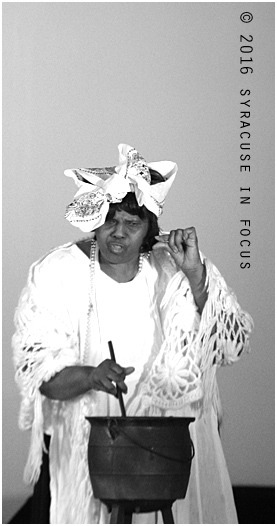 Stephanie Thomas played the character Aunt Ethel in production of The Colored Museum. This role was her debut with the Paul Robeson Performing Arts Company. 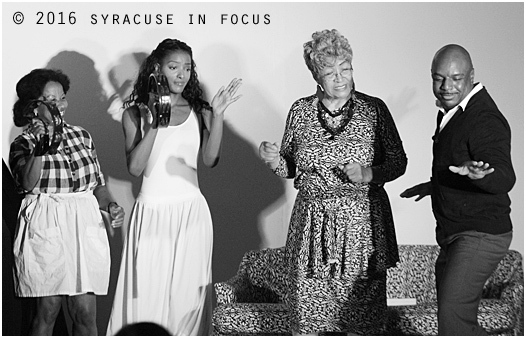 Karin Franklin-King, Nicole Blue, Bertha Adams and Lonnie Johnson prepare for the closing scene of “Last Mama on the Couch” in The Colored Museum. The play had a two-day run at Grace Episcopal Church along the Connective Corridor. Karin Franklin-King played Lala Lamazing Grace during last night’s performance of The Colored Museum. In the exhibit/sketch she confronts her former self. 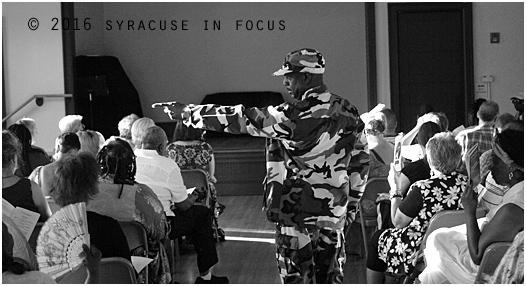 Franklin-King, who is a former TV talk show host, is also a member of the Board for the Paul Robeson Performing Arts Company. Lonnie Johnson made his debut with the Paul Robeson Performing Arts Company in the production of The Colored Museum. 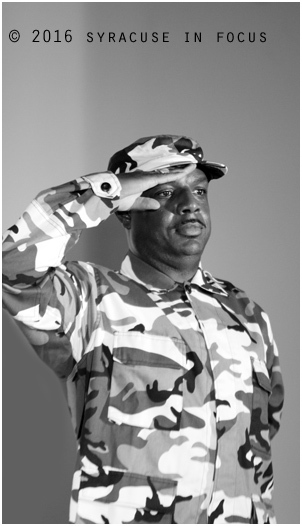 Johnson as a soldier in The Colored Museum. Rabbi Derrick Whit, who is also an actor and musician, played the role of Roj in The Colored Museum. He gets a drink from Debra Richardson (right). 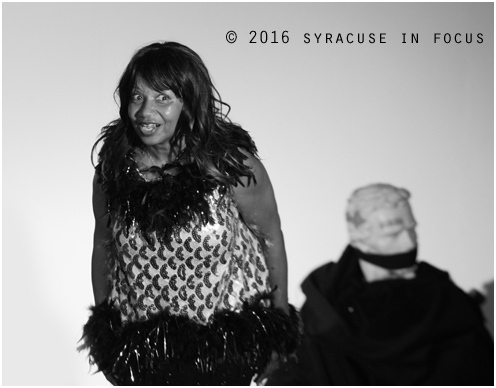 Annette Adams-Brown meandered her way through the crowd and continued to party on stage during her exhibit/scene for The Colored Museum last night. 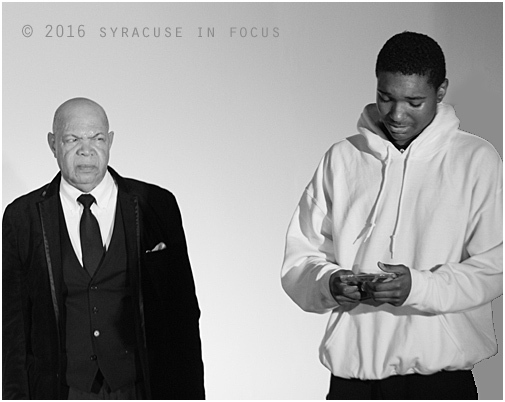 Adams-Brown is a costume designer and also board member for The Paul Robeson Performing Arts Company. The play was directed by Jackie Warren-Moore. 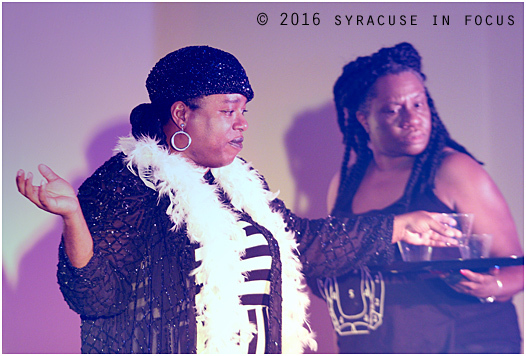 Debra Richardson (center) gets over herself and chooses none of the above during a scene from last night’s performance of The Colored Museum by the Paul Robeson Performing Arts Company. 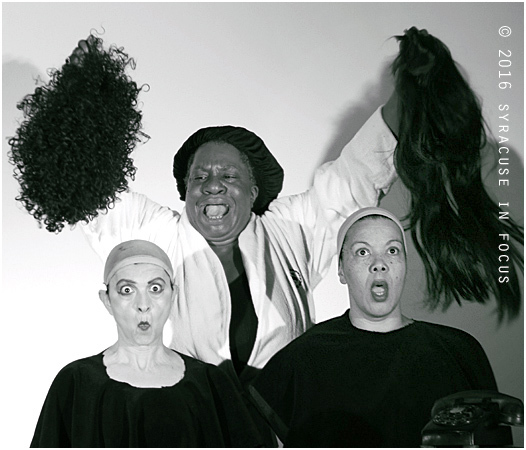 Binaifer Dabu and Sonceria Warren gave great face as the hilarious and critical talking wigs. This particular exhibit/scene is always a crowd favorite.